At Chick-fil-A Mercer Mall, community is important to us and it is our hope that we can enrich the lives of all of our guest. We enjoy getting to know our guests and look forward to any opportunity to give back to this community who has so graciously supported us. The next time you’re in our Restaurant, please introduce yourself. It would be our pleasure to meet you. Spirit Nights are a great way to help the community get involved and for us to contribute to each club hosting the event. Similar to a Spirit Night or Spirit Week, each organization can raise money by receiving a percentage of Mobile Ordering sales placed by customers (click photo above for application). Mobile Ordering Spirit Night fundraisers will conclude during the summer months. Spirit Week leverages the excitement of high school rivalries by offering a fundraiser to schools in our community during the week of their big game or for any type of event or rivalry – football, basketball, soccer or even a choral group or band (click photo above for rules/regulations). 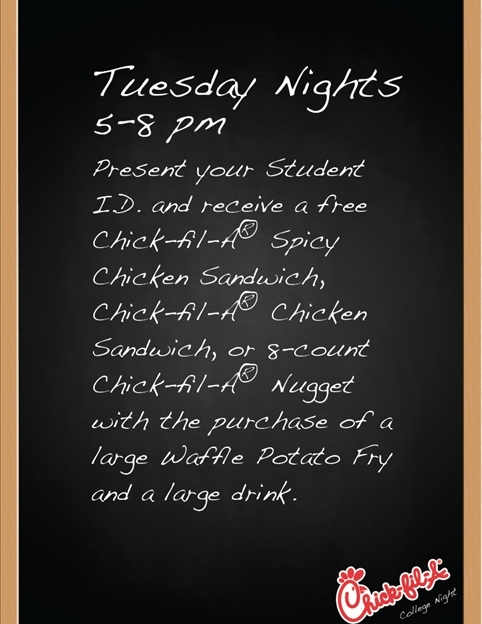 The Spirit Week fundraiser takes the Spirit Night concept and extends it into a competitive weeklong event where two rival schools invite their teachers, faculty, staff, students and families to visit our Chick-fil-A restaurant during that week. Join us for a special craft event once every three months! Bring your child to participate in a fun-filled evening of being artsy-craftsy.